How do you build a strong foundation for your position so that you aren’t moved one little bit if your horse spooks or stumbles or even TRIES to pull you out of the tack? Where do you start with strengthening your body so that you can be that unshakeable in the saddle while offering your horse a soft, steady, sympathetic connection with your hands, without gripping, pulling, or tightening up? The answer lies in core strengthening! But it’s not just about getting six pack abs like Brad Pitt flaunted in Fight Club. For a rider, or any athlete in a functional sport, training the core involves working ALL the muscles around the torso. Weak lower back muscles are often paired with weak abs, so this back extension exercise is a great place to start your core conditioning. 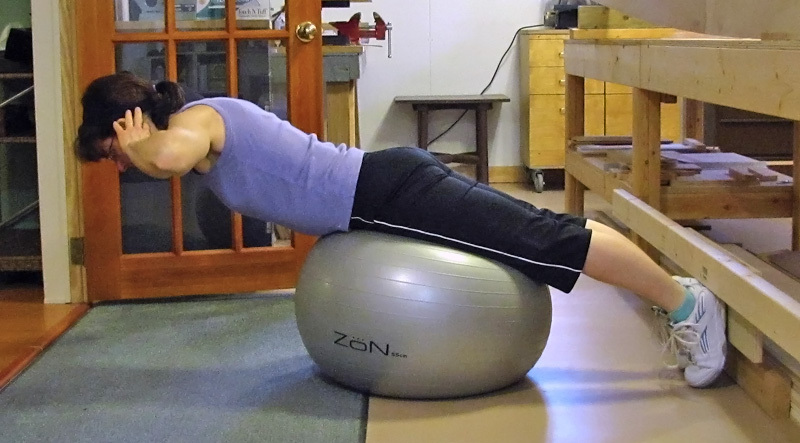 To begin, you need an exercise ball and somewhere to stabilize your feet. You can see in the photos that I have a board set up that I can wedge my feet under, or you could use the bottom of a couch, or have a partner hold your feet down. Trying to do this exercise without your feet stabilized makes it too easy and takes away a lot of the benefit. Lay over the ball, with the ball under your pelvis, and your feet stabilized. Put your hands by your ears, then slowly lift your torso up until it is lined up with your legs. Pause for a moment at the top, and then slowly lower yourself back down. That is one rep. Repeat a set of 12 to 15 reps. Work your way up to two or three sets per session. 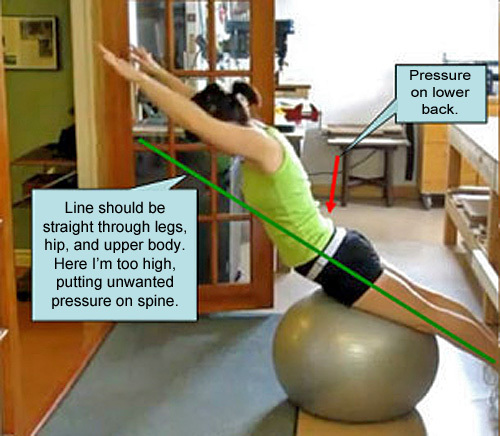 It is important to check your alignment at the top of the movement to be sure that you are not going too high, because doing so will put unwanted pressure on your spine. I use the glass door beside me to look at my reflection and make sure my alignment is good. You could also use a mirror or have a partner tell you when you have it right until you memorize the feeling of what is correct. Once you have mastered the basic back extension you can add some variations with weights to work your mid-back muscles. 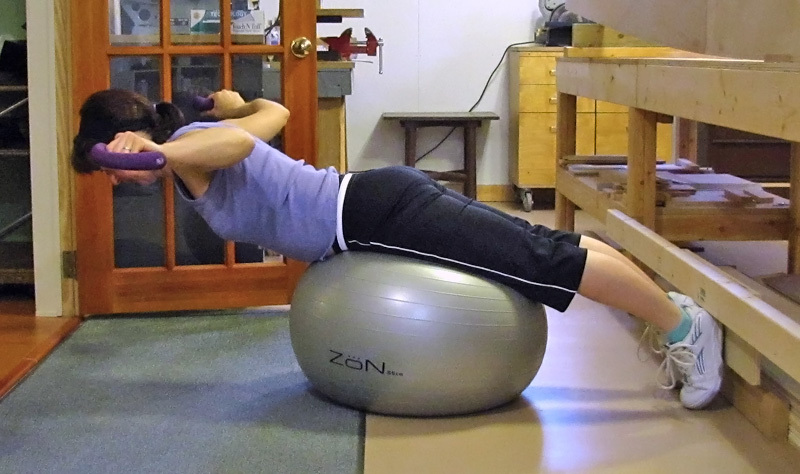 We can add a twist to the basic back extension to add in an element of instability (great for riders) and to work the obliques. 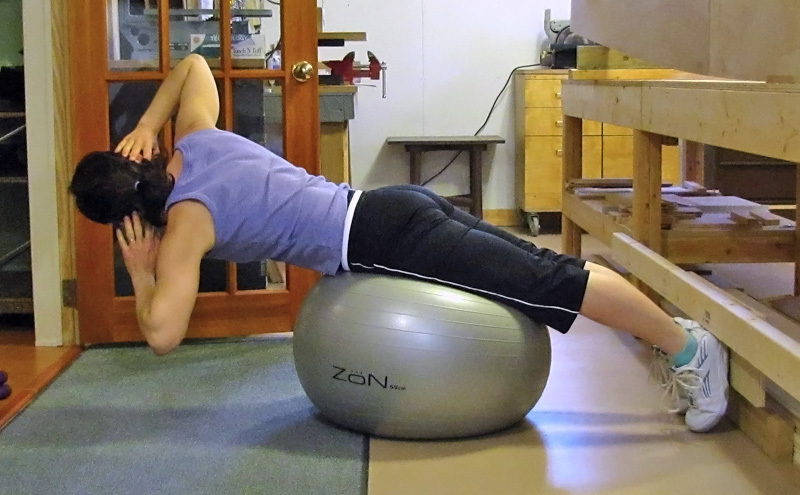 If you are crooked in the saddle, this is a good exercise to develop both sides of your body to work equally. To do it, raise up to the correct height for a back extension with your hands near your ears. Once you’re at the top, keep your hips straight on the ball while you turn one elbow to the ceiling and one to the floor, then turn the opposite elbow to the ceiling and the other one to the floor, then lower down. That is one rep. The sequence is: up, twist right, twist left, down. Concentrate on getting an equal amount of twist to each side to develop your symmetry.